TvNewsLIES.org • View topic - IMAGINE FINDING THIS IN YOUR DEAD RELATIVE'S GARAGE! Board index » General Discussion » BELIEVE IT OR NOT! IMAGINE FINDING THIS IN YOUR DEAD RELATIVE'S GARAGE! Post subject: IMAGINE FINDING THIS IN YOUR DEAD RELATIVE'S GARAGE! 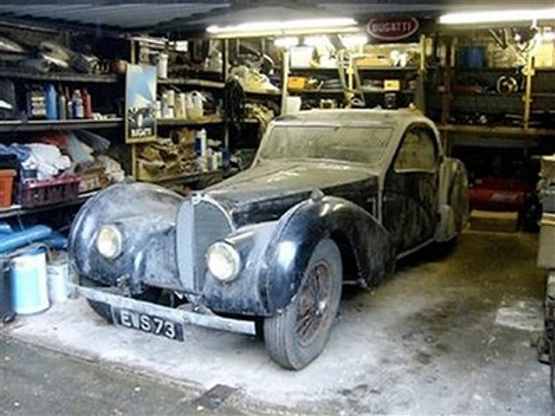 In this image released by Bonhams, an extremely rare 1937 Bugatti Type 57S Atalante, is seen in a garage in Gosforth, England, where it was found by relatives after the death of the owner, an elderly doctor who last used it around 1960. The Bugatti, one of only 17 ever made, is expected to draw a record price when it is auctioned in Paris next month. Post subject: Re: IMAGINE FINDING THIS IN YOUR DEAD RELATIVE'S GARAGE! Someone is very happy right now.